The 2017 Democratic primary for mayor is shaping up to be one hell of a fight. 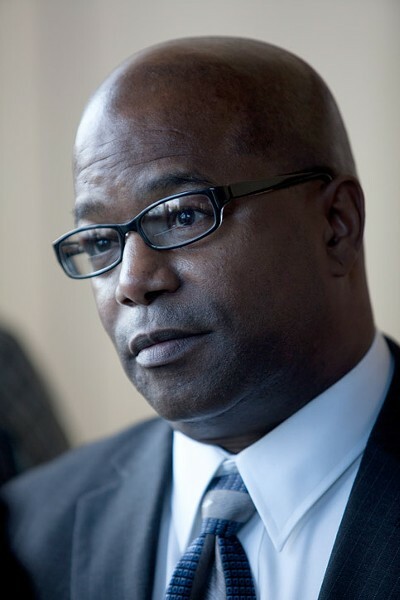 The latest: former Rochester Police Chief James Sheppard confirmed this week that he’s considering a run. Also exploring a bid is Rachel Barnhart, former WROC-TV8 reporter and anchor. Barnhart made the announcement earlier this month. To be clear, no one has officially declared his or her candidacy yet, not even Lovely Warren, the sitting mayor — but you have to assume she’s running unless she says otherwise. Sheppard, a Monroe County legislator, says that he’s talking to Democratic committee members, the public, and others about a possible run and that his decision will be based on their feedback. He says that he’ll make an announcement in January; his term in the Legislature ends in 2019. Sheppard retired as police chief in 2013, a month after Warren won the mayor’s race; the speculation was that Warren intended to replace him. Though Warren and Sheppard never publicly clashed, it was clear that Warren was not completely happy with the operation of the department. Warren was also rumored to be the driving force behind Mitch Rowe’s decision to run for County Legislature in 2015 — for the same seat that Sheppard was seeking. The word among some Democrats was that Warren wanted to solidify or broaden her influence in the Lej and knew that Sheppard wasn’t a guaranteed ally. Sheppard defeated Rowe, at that time the city’s director of planning and zoning, handily. And Rowe has always maintained that running was his decision, alone. Barnhart is expected to announce her decision in either January or February. She lost a hard-fought primary battle for State Assembly to Democrat Harry Bronson, the incumbent, earlier this year. A battle between Barnhart and Warren would be fascinating — and undoubtedly ugly. The two have quarreled publicly in the past and neither is known for backing down or is afraid of rocking the boat. Adding a Shakespearean splash to the whole thing is the involvement of lobbyist Robert Scott Gaddy. Gaddy and Warren are protégés of State Assembly member David Gantt, and Gaddy has been a major Warren supporter. But Gaddy is now backing Barnhart. Unless you believe the theory among some Dems that it’s an elaborate con; that Gaddy and Warren are manipulating Sheppard and Barnhart so that they split the anti-Warren vote, giving Warren enough votes to win the primary. It's not an easy theory to believe, though, and Barnhart’s team says that it's not true. "The theory that Rachel's possible campaign is subterfuge meant to support the incumbent says more about Rachel's strength as a candidate than the viability of Warren and Sheppard,” says a statement from Joe Rittler, spokesperson for Barnhart's exploratory committee. The statement accuses Warren and Sheppard of being beholden to high-ranking politicians: Gantt for Warren and State Assembly Majority Leader Joe Morelle for Sheppard, and chides Warren for not coming out and saying whether she’s running. “That's not the level of transparency we expect from our officials,” Rittler says. “Perhaps those peddling conspiracy theories should focus more on building a better community than trying to subvert the democratic process."